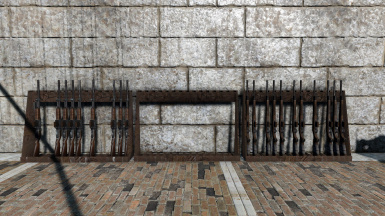 Adds a settlement armory equipped with handcrafted rifle racks and handgun rack to maintain your guards equipment with and ensure your settlers are ready to defend their homes at a moment's notice. This version is mostly for new users and those unlucky few still getting CTD even after following the instructions (See Sticky) to remove the corrupt normal maps from the textures folder (which should have fixed the issue for all users). Uninstall 1.0.0/1.1.0 and install the new version. If you have NOT experienced any CTD, or following my instructions in the sticky fixed your problem, I will leave it up to you as a judgement call -- you can choose to ignore this update or pick it up just to be safe. Carry on, nothing to see here! For a game that encourages you to recruit, arm, and outfit a standing militia, I felt the vanilla settlements were really lacking. Even the display racks that shipped with Contraptions were underwhelming. "Who is maintaining all this equipment?" I thought. And any time there's a crisis, everyone just rushes in, rifles and machine guns already in hand. "Do they just carry them around wtih them as they plow the fields?" 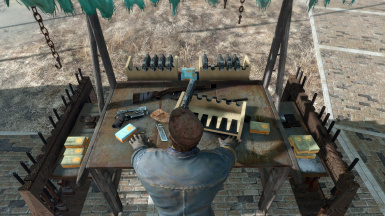 So, I decided I'd make an armory and weapon ready-racks for my settlements, and now I'm sharing them with you. 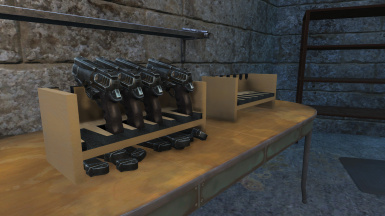 This mod adds original, hand-modeled handgun and rifle ready-racks, both empty and filled with weapons (depending on your tastes) as well as a fully-stocked, workable Armory for your guards to store their gear and have their equipment maintained by an assigned Armorer. If the Armory has a settler assigned, it raises settlement defense by 3. 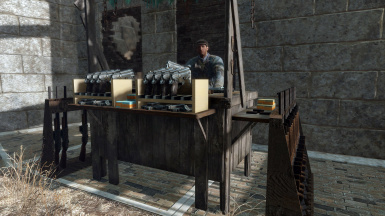 Note: The individually craftable racks are aesthetic only -- sorry, my Script-Fu is not powerful enough yet to be able to let you actually interact with them like the Contraptions display racks. It's on the To-Do list. Everything added in this mod is original, so there should be no conflicts. Textures -- textures used in this mod were created using GreyScaleGorilla's Texture Kit Pro. They've got great products and tutorials for those of you using Cinema4D to make your mods.